Hillary Clinton overwhelmingly made the grade with white college graduates in a showdown with Donald Trump, a Bloombergpoll released Tuesday finds — and that's not good news for the Republican Party. The presumptive Democratic nominee led her likely GOP opponent 48% to 37% among a demographic that Republican Mitt Romney won by a handy 14 percentage points in his 2012 race against President Barack Obama. College-educated whites have voted for the Republican presidential nominee over the Democrat for decades, Bloomberg noted, citing data showing no Democratic White House hopeful has carried the group since 1952. The upshot? "The findings suggest Trump is struggling to even rebuild the losing coalition Romney assembled," Bloomberg concluded — although other polls say the presumptive 2016 GOP nominee has shown more pull than Romney did with white voters who lack a college degree. Among all college graduates — a group that accounted for nearly half the electorate four years ago — likely to vote, the former secretary of state had an even stronger showing in the Bloomberg Purple Slice poll: Clinton trounced Trump 54% to 32%. In 2012, Obama had just a two-point advantage over Romney in that demographic. 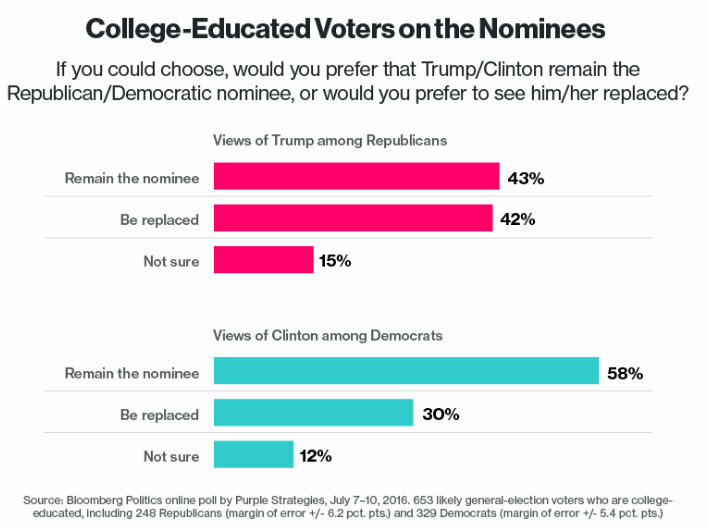 What's more, the poll found college-educated Republicans split on whether they'd prefer Trump to remain as their party's nominee, with 43% saying they would and 42% saying they wish the GOP would put forth someone else. 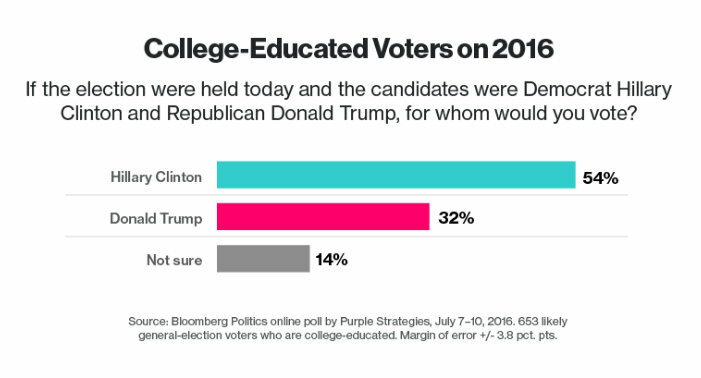 College-educated Democrats overwhelmingly backed Clinton, 58% to 30%. Clinton's popularity with college-educated whites could give her a boost in competitive states such as Virginia, Colorado and North Carolina, according to Bloomberg, but she might not outstrip Obama's performance in Iowa and Ohio, where those voters make up a smaller portion of the electorate. It wasn't all good news for the former first lady, the poll found: "Reflecting her gender gap, Clinton trails very slightly among college-educated white men, with Trump getting 42% and Clinton getting 41%. 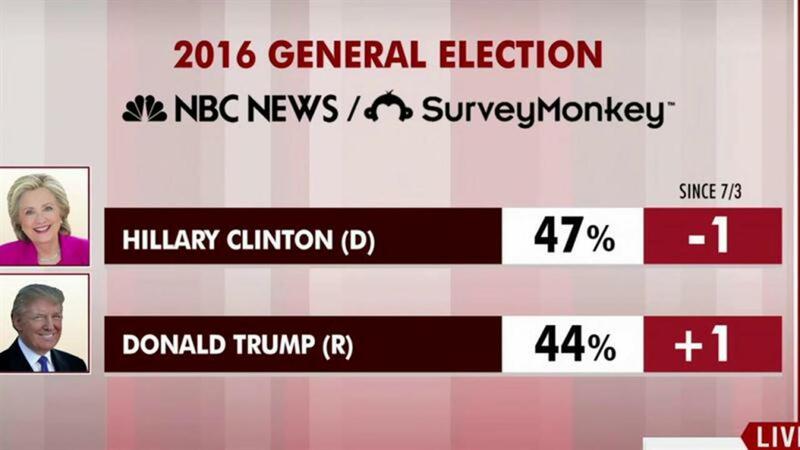 Among white women, Clinton outpaces Trump 54% to 33%." Going negative: Voters with a college degree chose the controversy over Clinton's use of a private email server while at the State Department as her biggest negative, with 47% saying "they were bothered a lot" that the FBI determined she and her staff were careless with sensitive information. Trump's greatest failing with college-educated voters was referring to women in derogatory terms such as "bimbo" and "pig." Nearly 70% of those polled said that bugged them deeply. Clinton impressed those voters more than Trump in a test of voters' feelings on the candidates' leadership traits, including "being ready to lead the country on day one in office" and "ability to get things done in Washington." But Trump bested Clinton in the new poll when it came to which candidate would do the most to change how Washington works and who'd be more likely to take on Wall Street. It wasn't much of a popularity contest, either: Although educated voters preferred Clinton as Obama's successor, 53% said they actually viewed her unfavorably. A whopping 73% said the same of Trump.